Watch two culinary heavyweights go head-to-head, creating dishes for each guest to eat and judge. 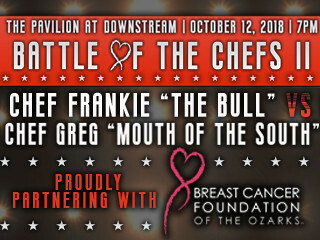 Who’s the next “Battle of the Chefs” winner? You decide! Live Band at 6:30pm and show starts at 7pm. Portion of the proceeds go to Breast Cancer Foundation of the Ozarks. Tickets include food, non-alcoholic beverages, and 2 alcoholic drink tickets- must be 21 years of age to receive drink tickets. Drink tickets are picked up inside the venue day of show. There are 8 seats to a table. All seating is first come first serve.